An impressive policy paper: Self trading is not synonymous with market abuse by Nidhi Aggarwal, Chirag Anand, Shefali Malhotra, Bhargavi Zaveri, 29 June 2015, and an impressive response by SEBI today: Sebi reverses stand on self-trades by Jayshree P. Upadhyay in Mint. Finance for the poor: policy and not programs by Ajay Shah in The Business Standard, 19 September. Stopping the clock going back in Singur by Ashok K Lahiri in The Business Standard, 15 September. SEBI's Flawed Attempt at Setting the Frequencies Right by Kanad Bagchi in The Wire, 15 September. Accountability of justice by K. Parasaran in The Indian Express, 14 September. Top Russian anti-corruption official had $120M in cash in his apartment by Cory Doctorow in The Boing Boing, 11 September. This reminds us about the fallacy of searching for something like a Lok Pal who will solve all our problems. This also made me find out the Weight of a million dollars by Richard-ga in Google Answers., 05 Feb 2006, and brings a new perspective to illicit money movements in the context of Faulty tradeoffs in security, 10 May 2010. A note for Dr Patel by Ila Patnaik in The Indian Express, 9 September. Before amending the law by Abhinav Kumar and Sudhanshu Sarangi in The Indian Express, 9 September. NCRB data: handle with care by K. P. Asha Mukundan in The Hindu, 9 September. Air pollution cost India 8.5% of its GDP in 2013: study by Dipti Jain in The Mint, 9 September. Tariffs Do More Harm Than Good at Home by Maurice Obstfeld in The iMF direct Blog, 8 September. The need for a 'totaliser' revolution by Sanjay Kumar in The Hindu, 7 September. China's Summer of Discontent by Elizabeth C. Economy in The CFR Blog, 6 September. Not majority vs minority by Pratap Bhanu Mehta in The Indian Express, 6 September. Vaccination isn't just for babies by Sujata Kelkar Shetty in The Mint, 5 September. No harm in pre-consultation by Somasekhar Sundaresan in The Business Standard, 5 September. The house is on fire! by Gary Saul Morson in The New Criterion, September 2016. Myths and realities about America's infrastructure spending by Edward L. Glaeser in The City Journal, Summer 2016. Aadhaar by Numbers by Sunil Abraham in NIPFP YouTube Channel. Academic snobbery about top journals and top universities is under serious attack. Even without retractions top journals publish the least reliable science in The Bjoern Brembs Blog, January 2012. Why might this be happening? The top journals probably encourage research that is more conscious of fashion, does more p-hacking, with authors who do more social engineering. Also see. How to test your decision-making instincts by Andrew Campbell and Jo Whitehead in The McKinsey Quarterly, May 2010. In 2015, the Central Statistical Office (CSO) revised the way GDP is calculated in India. According to the new series, India is the fastest growing large economy in the world, with a 7.1 percent real growth rate. Other trusted measures of the state of the economy convey a discordant picture. This discrepancy has led to an active debate comprising two parts. One part of the debate has been arguments about the extent to which the official GDP data are accurate. The second part of the debate is based on criticising CSO's methods. This article summarises the literature that examines CSO's methods. There are two main areas of concern: the way manufacturing Gross Value Added (GVA) has been estimated and the methodology for calculating deflators. The manufacturing sector has been at the centre of the GDP debate. The methodological changes for this sector and consequently the data revisions have been substantial. Manufacturing growth for 2012-13 was revised up from 1.1 percent to 6.2 percent, while that for 2013-14 was increased from -0.7 percent to 5.3 percent. Various authors (Nagaraj, 2015a, 2015b, 2015c; Rajakumar, 2015; Nagaraj and Srinivasan, 2016; Sapre and Sinha, 2016) have questioned the reliability of the new estimates, on several grounds. Enterprise vs. Establishment approach: In a major innovation, the new GVA methodology shifted data collection from establishments (or factories) to enterprises (or firms). Sapre and Sinha (2016) point out that lack of clarity on measures of output and costs at the enterprise level can lead to imprecise estimates of GVA. The activities of firms can be much more diverse than those of factories, and not all of these functions would qualify as manufacturing. Yet all the value added of enterprises classified as "manufacturing firms" has gone into the calculation of manufacturing GVA. This will inflate the level of output and possibly also the growth rate, if the ancillary activities are growing faster than the manufacturing ones. Blowing up of GVA: Extrapolating from samples ("blowing up") is not a new feature of the current GDP series. What has changed is the database used. Previously, manufacturing GVA was based on the RBI's fixed sample of large private companies. Under the new series, the MCA21 database is used to compile a set of "active" companies, which have filed their annual financial returns at least once in the past three years. The problem is that for any given year, information from several active companies remains unavailable till a cut-off date of data extraction. In such a case, the GVA of available companies needs to be blown-up to account for the unavailable companies. There are multiple issues in this blowing-up method. The year wise number of available and active companies in manufacturing is not publicly available. Hence, year on year, the exact number of companies for which the GVA is blown up is unknown. While the Ministry of Corporate Affairs has made filing of annual financial returns mandatory for all registered companies, it is not known how many of these companies produce any output on a regular basis. The blowing-up factor is the inverse of the ratio between the paid-up capital (PUC) for the available companies and that for the active set as a whole. Nagaraj (2015a, 2015b) argues that this is inappropriate since a large fraction of the MCA21 active set are "fictitious, shell companies" that exist only on paper. In that case the blowing-up method is likely to overestimate GVA. Sapre and Sinha (2016) argue that blowing-up using the PUC is an inappropriate method because PUC and GVA do not have any one-to-one relation. Also, it is possible that the actual GVA of some "active but unavailable" companies is negative for a particular year. In those cases, blowing up of GVA using the PUC factor method can lead to overestimation. The actual computation of the blowing-up factor applied by the CSO in the new series has not been described in detail in the official documents. This makes it difficult to replicate the process and analyse it. A single blowing-up factor has been used for private as well as public limited companies. Rajakumar (2015) points out this is not appropriate as the two groups are widely divergent in their patterns. The number of "available" companies reporting their annual financial returns with MCA varies across the years. As a result, the blowing-up factor that accounts for the non-reporting companies will also vary from year to year. As highlighted by Nagaraj (2015a, 2015b) and Sapre and Sinha (2016), this variation will result in wide fluctuations in the final GVA estimates. Identification of manufacturing companies: Sapre and Sinha (2016) find that within the manufacturing sector several companies operate as wholesale traders or service providers. These companies may have changed their line of business since they were originally registered. These changes do not get reflected in the Company Identification (CIN) code assigned to the companies. Such misclassification of companies will distort the manufacturing estimates, although not the overall GVA. MCA 21 vs. IIP : There are other problems with the manufacturing GVA calculation that have not been written about much. For the manufacturing sector, the GVA is derived from a combination of MCA 21 numbers, Index of Industrial Production (IIP) estimates and estimates of the unorganized sector from the Annual Survey of Industries (ASI). While the MCA21 is a new database, the base year for the IIP data is still 2004-05. Also the data obtained from MCA 21 follows an "enterprise" approach as mentioned earlier, but the data obtained from ASI follows the old "establishment" approach. The full implications of these discrepancies are yet to be fully understood. Previously, estimates of real GDP relied heavily on production indices such as the IIP. Now, most real numbers are derived by taking nominal data and deflating them by price indices. If done well, this approach can give a more accurate measure of value added. But if the deflators used are inappropriate, the estimated real magnitudes will be distorted. And this may well have happened in the past few years, since there have been very large changes in relative prices (especially petroleum and other commodities), which are inherently difficult to capture in aggregate deflators. The issues here are as follows. Double deflation: In most G20 countries, real manufacturing GVA is computed using a methodology known as double deflation. In this method, nominal outputs are deflated using an output deflator, while inputs are deflated using a separate input deflator. Then, the real inputs are subtracted from real outputs to derive real GVA. But in India things are done differently. Here, we compute the nominal GVA, and then deflate this number using a single deflator. If input prices move in tandem with output prices, both methodologies will give similar results. But if the two price series diverge- as they have for the past few years in India- single deflation can overstate growth by a big margin. The reason is not difficult to see. If the price of inputs falls sharply, profits will increase, and nominal value added will go up. Since real GDP is supposed to be measured at "constant prices", this increase needs to be deflated away. Double deflation will do this easily. But single deflation will not work. In fact, if a commodity-weighted deflator like the Wholesale Price Index (WPI) is used, as is the case under the current methodology, nominal growth will be inflated, on the grounds that prices are actually falling! In this case, real growth will be seriously overestimated. A fuller explanation is provided here. As the gap between input and output inflation starts to close, the problem will diminish. But that could also send a misleading signal, because it might seem that growth is slowing, when only the measurement bias is disappearing. Service sector deflator: Deflator problems also plague the estimates for the service sector, which accounts for the bulk of GDP. Currently, the deflator used for much of this sector is the WPI. But the weight of services in the WPI is negligible. If instead the services component of the Consumer Price Index (CPI) were used, growth in this sector would be far lower than currently estimated. WPI vs. CPI : Finally, there are questions about whether the WPI should really be used as a deflator, at all. The weights are now more than a decade old, and India's economic structure has changed radically over this period. In addition, the sample frame (the selection of goods sampled) is also out of date. The CPI is a better price index [link, link]. Releasing disaggregated information on firm output and cost items, to permit more precise estimation of manufacturing GVA given the shift from the establishment to the enterprise approach. Altering the definition of the active set of manufacturing companies, to ensure the companies are truly active. Releasing the number of active and available companies every year by industry or sector, to get a sense of the companies contributing to GVA. Shifting the blowing-up factor from paid-up capital to another indicator, such as replacing growth rates for "active but unavailable" companies by the overall growth rate for the relevant subsector. Using separate blowing-up factors for public and private limited companies. Currently the blowing-up factor does not take into account the size, industry or ownership of the unavailable companies. Reviewing the classification of companies to ensure they are categorized appropriately. Providing greater clarity and transparency about the database and methodology used to estimate the manufacturing sector GVA. Also, documents could be released explaining the precise method used to blow up the GVA estimates. Adopting the double deflation method to calculate real manufacturing GVA. Using the relevant CPI components to deflate service sector GVA. More generally, the WPI could be replaced by the relevant CPI components, in the long period before a Producer Price Index (PPI) is developed which would be an ideal deflator. Until this methodological debate subsides, official GDP data should be used with caution as it may not accurately reflect conditions in the economy. Other proxies for output are required. Nagaraj, R. (2015a), Seeds of doubt on new GDP numbers Private corporate sector overestimated?, Economic and Political Weekly, Vol. L, No. 13. Nagaraj, R. (2015b), Seeds of doubt remain: A reply to CSO’s rejoinder, Economic and Political Weekly, Vol-L, No. 18. Nagaraj, R. (2015c), Growth in GVA of Indian manufacturing, Economic and Political Weekly, Vol-L, No. 24. Nagaraj, R. and T.N. Srinivasan (2016), Measuring India’s GDP Growth: Unpacking the Analytics & Data Issues behind a Controversy that Refuses to Go Away, India Policy Forum, July 2016. Rajakumar, J Dennis (2015), Private corporate sector in new NAS series: Need for a fresh look, Economic and Political Weekly, Vol-L, No. 29. Sapre, Amey, and Pramod Sinha (2016), Some areas of concern about Indian Manufacturing Sector GDP estimation, NIPFP Working Paper 172, August 2016. The author is a researcher at the Indira Gandhi Institute of Development Research. Rajeswari Sengupta is a researcher at the Indira Gandhi Institute of Development Research. Commercial wisdom to judicial discretion: NCLT reorients IBC, 13 December 2017. NPA Ordinance: The impact of secrecy in ordinance making, 30 June 2017. Understanding the recent Banking Regulation (Amendment) Ordinance, 2017, 8 May 2017. Demonetisation needs a Parliamentary law to be fool-proof, 1 December 2016. The great Indian GDP measurement controversy, 10 September 2016. Measuring the transmission of monetary policy in India, 1 September 2016. Analysis of the recent proposed SARFAESI amendments : are these consistent with the Insolvency and Bankruptcy Code?, 29 May 2016. Bankruptcy reforms: It's not the ranking that matters, 13 November 2015. Unique Identification Authority of India (UIDAI) had the goal of issuing unique identification numbers to every resident of India. In a country as large as ours, this was a difficult task to achieve. UIDAI has largely accomplished this within a short period of about six years. I believe it was able to do this only because it took many innovative and bold decisions. In a recent paper I examine some of these innovations. The paper also tries to derive lessons from UIDAI that could be applied in other government projects. The UIDAI felt that unless iris images were used in addition to fingerprints, it would not be able to fulfil its mandate of unique identification. However, there were many concerns related to the use of iris images. Was this technology mature enough? Was it too expensive? Were there enough vendors in the market to prevent lock-in? The UIDAI set up a committee to deliberate on the issue of which biometrics to collect and what standards to use for unique identification. This committee recognised the value of using iris images in improving accuracy. However, it fell short of recommending the inclusion of the iris in the biometric set and left the decision to UIDAI. After a detailed examination, the UIDAI came to the conclusion that the inclusion of iris to the biometric set was necessary for a number of reasons, such as ensuring uniqueness of identities, and achieving greater inclusion. In retrospect, this turned out to be one of the most important decisions of the UIDAI. The practice of conducting on-field trials was an important innovation. When UIDAI began its mission, there were many questions inside and outside the organisation on whether the very idea of unique identification for every resident was feasible at all. The idea of using biometrics to ensure the unique identification and authentication of all residents in India was an untested one. There were many assumptions behind it, and the data required to test the validity of these assumptions was not available. For instance, most of the research done on using biometrics for identification or authentication was done in western countries, and that too, on relatively small numbers of people. The knowledge which had been produced by Western researchers was not applicable in the Indian context. Could the fingerprints of rural residents and manual labourers be captured successfully, or would they be excluded from Aadhaar? What about the iris images of old or blind people? Do the devices available in the market serve the purpose? What would be the most efficient and effective way to organise the process of enrolment? These questions needed to be answered if the project was to be successful. The strategy adopted at UIDAI was to conduct a set of trials (called Proofs of Concept, PoCs) in several states across the country. The areas were selected to be representative of real-life enrolment and authentication. A number of biometric capture devices of different makes were used, and several different enrolment processes were tried out. The PoCs were carefully designed to answer sharply articulated questions, either to verify UIDAI's assumptions, or to capture the data required to fill in gaps in the UIDAI's knowledge. In essence, the scientific method was applied to create the knowledge that was pertinent to the decisions that had to be made at UIDAI. Resources had to be allocated to this work, and in return for that, major sources of project risk were eliminated. The results of the PoCs indicated that the major hypothesis of the UIDAI was correct: that it was indeed possible to capture biometric data that was fit for the purpose of deduplication and verification. The results also showed that iris capture did not present any major challenges. An efficient enrolment process was devised using the data captured during these trials. The last innovation considered in the paper relates to competition. Given the scale and importance of the project, the UIDAI felt it was important to increase efficiency and reduce costs by leveraging the competencies available in the private sector. At the same time, it was also essential to avoid a situation where any one private player could exercise significant power over the effective functioning of the Aadhaar system: the Authority wanted to ensure that there was a competitive market for providing services to it. To promote such a competitive market, the Authority used a two-pronged strategy of using open standards (creating standards where there were none), and using open APIs (Application Programming Interfaces). The Authority used this strategy in procuring vendors for deduplication. Algorithms for deduplication had never been tested at the scale required in this project. To reduce the risk of poor quality deduplication, the UIDAI came up with a novel solution. It decided to engage three biometric service providers (BSPs), instead of just one. These BSPs would interface with the UIDAI systems using open APIs specified by the Authority. This decision helped avoid vendor lock-in, and increased scalability. The UIDAI selected the three top bidders on the basis of the total cost per deduplication. Even after these three vendors were selected, the Authority was able to set up a competitive market among them, using an innovative system to distribute deduplication requests among them. Vendors were paid on the basis of the number of deduplication operations they were able to carry out, and the Authority allocated operations to them on the basis of how fast and how accurate they were. This led to a situation where the BSPs were constantly competing with each other to improve their speed and accuracy. Where standards were not present, the UIDAI was willing to create new standards in order to increase competition. At the outset of UIDAI's work, every biometric device had its own interface, distinct from the interfaces of other biometric devices. If a capture application wanted to support 10 commonly used devices, then the application developer would have to implement 10 different interfaces. This would have made it costly to bring new devices into the project, even if these new devices were cheaper and better. In order to avoid this situation, the UIDAI created an intermediate specification. Vendors could implement support for this specification, and their devices could be certified. This allowed all capture applications to work with all certified devices. The success of the UIDAI offers many lessons for other government projects. Perhaps the first lesson that can be drawn from it is that innovation is indeed possible within the government. Government processes need not prevent it from taking innovative decisions. In fact, processes commonly used within the government, such as expert committees and consensus-based decision-making, can provide methods to examine difficult issues in a credible manner. High-quality procurement and project management skills can help the government outsource many functions that are currently housed within it. The paper also suggests that scale and complexity need not be deterrents to private sector participation: in fact, the large scale of government projects can make the project more attractive to private parties. Another lesson government agencies could learn from the UIDAI is the need to test major hypotheses through field trials before launching projects at scale. Conducting such field trials provides an opportunity to change the design or the implementation roadmap well in time, thus saving precious public money from being wasted. The UIDAI could achieve its objective because it adopted a different approach from most government organisations. It took tough decisions, such as the one to use iris images; it expended resources on building pertinent knowledge, by constantly experimenting on the ground and learning from these trials; and it exploited private-sector competition to achieve its task at the lowest cost. It should be noted that this is not an exhaustive list of its innovations, but without these three decisions, it is unlikely the UIDAI would have been able to fulfil its mission. Even large government projects can be done fast and efficiently. Government processes need not be obstructive. In fact, the mechanisms of bureaucracy, such as committees, adherence to financial regulations, and desire for consensus, can help to resolve difficult issues and take tough decisions. Well-designed pilots and field-tests can help the government evaluate the effectiveness of large programs, so that it can deploy public resources more usefully. High quality procurement and contract-management processes can enable the government to leverage the dynamism of the private sector to provide public goods effectively. I am grateful to Prasanth Regy and Ajay Shah, both of NIPFP, for stimulating discussions. The author is Chairman, Telecom Regulatory Authority of India (TRAI) and was part of the founding team at UIDAI. by Radhika Pandey, Ila Patnaik, Ajay Shah. Most macroeconomics is about business cycle fluctuations. The ultimate dream of macroeconomic policy is to use monetary policy and fiscal policy to reduce the amplitude of business cycle fluctuations, without contaminating the process of trend GDP growth. From an Indian policy perspective, this agenda is sketched in Shah and Patnaik (2010). The starting point of all these glamorous things, however, is measurement. The major barrier to doing Indian macroeconomics is the lack of the foundations of business cycle measurement. The first milestone in this journey is sound procedures for seasonal adjustment of a large number of macroeconomic time series. At NIPFP, we have built this knowledge in the last decade, and insights from this work are presented in Bhattacharya et. al, 2016. The next milestone is dates of turning points of the business cycle. As an example, in the US, the NBER produces a set of dates. These dates are extremely valuable in myriad applications. 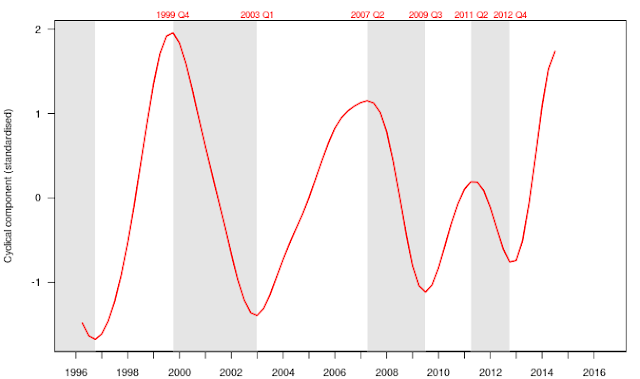 As an example, the standard operating procedure when drawing the chart of a macroeconomic time-series is to show a shaded background for the period which was a contraction. 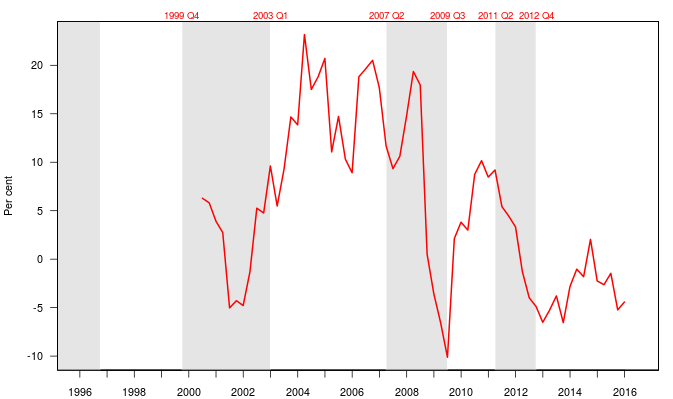 Here is one example: y-o-y CPI inflation in the US, with recessions shown as shaded bars. In the Indian setting, several papers have worked on the problem of identifying dates of turning points of the business cycle (Dua and Banerji, 2000, Chitre, 2001, Patnaik and Sharma, 2002, Mohanty et.al, 2003). In the older period, India was an agricultural economy, and the ups and downs of GDP growth were largely monsoon shocks. It is only in the recent period that we have got structural transformation, and the market process of cyclical behaviour of corporate investment and inventory, which add up to a business cycle phenomenon that is recognisably related to the mainstream conception of business cycles (Shah, 2008). This motivates a focus on the post-1991 period. We are able to shift from annual data to quarterly data by starting in the mid 1990s. We have the laid the groundwork for this to be a system, with regular updation of the dates, rather than a one-off paper. One approach to business cycle measurement focuses on ``growth cycles'', and relies on detrending procedures to extract the cyclical component of output. The cycle is defined to be in the boom phase when actual output is above the estimated trend, and in recession when the actual output is below the estimated trend. This identifies expansion and contraction based on the level of output. In contrast, the ``growth rate cycle'' identifies turning points based on the growth rate of output. For the post-reform period in India, this is more appropriate. At an intuitive level, the procedure works as follows. First, we remove the trend and focus on fluctuations away from the trend. Second, we remove the high frequency fluctuations (below two years) and the low frequency fluctuations (above eight years). What's left is in the range of frequencies which are considered `the business cycle'. Third, we identify turning points in this series. In terms of tools and techniques, we use the filter by Christiano and Fitzgerald. The Christiano Fitzgerald filter belongs to the category of band-pass filters. This is used to extract the NBER-suggested frequencies from two to eight years. To this filtered cyclical component, we apply the dating algorithm developed by Bry and Boschan, 1971. Our analysis is focused on seasonally adjusted quarterly GDP series (Base year 2004-05). This series is available from 1996 Q2 (Apr-Jun) to 2014 Q3 (Jul-Sep). The CSO revised the GDP series with a new base year of 2011-12. The revised series is available only from 2011 Q2. Hence we stick to the series with old base year for our analysis. As an example, look at the period of the Lehman crisis. It is well known that the economy was weakening well before the Lehman bankruptcy in September 2008. As an example, INR started depreciating sharply from January 2008 onwards. The evidence above shows that the economy peaked at Q2 2007, and started weakening thereafter. Each turning point is a fascinating moment. In Q2 2007, i.e. Apr-May-Jun 2007, growth was good but the business cycle was about to turn. It is interesting to go back into history to each of these turning points and think about what was going then, and what we were thinking then. Our findings on business cycle chronology are robust to the choice of filter and to the choice of the measure of business cycle indicator. We conduct this analysis using different measures of business cycle indicators such as IIP, GDP excluding agriculture and excluding government, and Firms' net sales, and find broadly similar turning points. Details about these explorations are in the paper. This is not a one off paper. We will review these dates regularly and update the files, while avoiding changes in URLs. When the methods run into trouble with future data, we will address these problems in the methods. This work would thus become a part of the public goods of the Indian statistical system. All key materials have been released into the public domain. In addition to a paper web page, we have a system web page which gives a .csv file with dates at a fixed URL and can be used e.g. in your R programs. The graph above shows the familiar series of seasonally adjusted annualised growth, of the net sales of non-financial non-oil firms, with shaded bars showing downturns. This series only starts after 2000 as quarterly disclosure by firms only started then. Placing this series (net sales of firms) into the context of the business cycle events gives us fresh insight into both: we learn something about the sales of firms respond to business cycle fluctuations, and we learn something about business cycle fluctuations. It is useful to know summary statistics about the Indian business cycle: the average duration and amplitude of expansion and recession and the coefficient of variation (CV) in duration and amplitude across expansions and recessions. The average amplitude of expansion is seen to be 2.5% while the average amplitude of recession is 2.2%. The average duration of expansion is seen to be 12 quarters while the average duration of recession is seen to be 9.3 quarters. These are fascinating new facts in India. There is more heterogeneity in the amplitude of a downturn when compared with expansions. In recent decades a number of emerging economies have undergone structural transformation and introduced reforms aimed at greater market orientation. There is an emerging strand of literature that studies the changes in business cycle stylised facts in response to these changes. 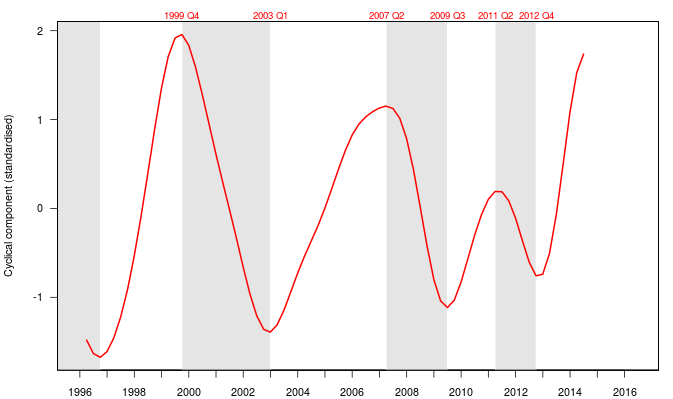 Studies find that business cycle stylised facts have changed over time (Ghate et.al, Alp. et.al, 2012). In the paper, we explore some of these changes. In the post-reform period, both expansions and recessions have become diverse in terms of duration and amplitude. Some episodes of recession are relatively more deeper and severe relative to others in the post-reform period. Similarly there is considerable variation in the duration of expansion and recession across specific cycles in the post-reform period. Some are short-lived while others are relatively more persistent. Rudrani Bhattacharya, Radhika Pandey, Ila Patnaik and Ajay Shah. Seasonal adjustment of Indian macroeconomic time-series, NIPFP Working Paper 160, January 2016. Radhika Pandey, Ila Patnaik and Ajay Shah. Dating business cycles in India. NIPFP Working Paper 175, September 2016. Ajay Shah (2008). New issues in macroeconomic policy. In: Business Standard India. Ed. by T. N. Ninan. Business Standard Books. Chap. 2, pp.26--54. Ajay Shah and Ila Patnaik (2010). Stabilising the Indian business cycle. In: India on the growth turnpike: Essays in honour of Vijay L. Kelkar. Ed. by Sameer Kochhar. Academic Foundation. Chap. 6, pp.137--154. Financial reforms: A mid-term report card by Ajay Shah in The Business Standard, 5 September. With a new ban on antibacterial soap, the US government is finally acknowledging that it's not just ineffective, it's also dangerous by Elijah Wolfson in The Quartz, 02 September. Sydney and Melbourne have canceled concerts celebrating Chairman Mao by Isabella Steger in The Quartz, 01 September. I have always been struck by how Hitler is treated differently from Stalin and Mao. You can actually buy Stalin and Mao memorabilia in Moscow and Beijing. You want to pay the publisher but you don't want the publisher monitoring what you read. Publishers must let online readers pay for news anonymously by Richard Stallman in The Guardian, 1 September and an open source software system to implement this: Electronic payments for a liberal society! Real costs of high-frequency trading by Venkatesh Panchapagesan in The Mint, 31 August. Day of the specialist by Manish Sabharwal in The Indian Express, 29 August. Reverse Voxsplaining: Drugs vs. Chairs by Scott Alexander in The Slate Star Codex, 29 August. Dalits are right: Enough is enough by P Chidambaram in The Indian Express, 28 August. Perumal Murugan returns by Salil Tripathi in The Mint, 25 August. Sedition law cannot be used against honest views, expressed peacefully by Soli J. Sorabjee in The Indian Express, 25 August. Here is proof that banks mis-sell and Yes, banks mis-sell. Now what? by Monika Halan in Mint, unveiling the recent Halan & Sane paper. Why Maharashtra CM Devendra Fadnavis must make new mandis work by Financial express in The Financial Express, 23 August. The `Know-Do' gap in primary health care in India by Jeffrey S. Hammer in NIPFP YouTube Channel. Smugglers Secretly Repairing Russian Roads to Boost Business in The Moscow Times, 22 August. Contrary reading of law by regulator by Somasekhar Sundaresan in The Business Standard, 22 August. Nigerian startups can't raise money through crowdfunding because of antiquated laws by Yomi Kazeem in The Quartz, 19 August. India has a similar innovation-unfriendly financial regulatory environment. Why inflation targeting works by Rajeswari Sengupta in The Mint, 16 August. Use the Web instead by Ruben Verborgh on Ruben Verborgh's blog, 05 August. How a new source of water is helping reduce conflict in the Middle East by Rowan Jacobsen in The Ensia, 19 July. by Satya Poddar and Ajay Shah. A previous article, Sequencing in the construction of State capacity: Walk before you can run argues that in public administration, we should first reach for a modest objective, i.e. a low load, and build sound public administration systems, i.e. adequate load bearing capacity. Only after the systems have been proven to work at a low level of load should we consider increasing the load. In building tax administration, the load is defined by (a) The tax rate and (b) The complexity of the tax in its very design - e.g. a sales tax is easier than an income tax. If the tax rate is low, the employee of the tax collection agency has a greater incentive to collect the tax. When the tax rate is high, there is a greater temptation to just take a bribe instead. If the tax system is simple, there is reduced discretion at the front line, and thus reduced rent-seeking. In places like the UK, where there is high State capacity, income tax began at low income tax rates. When Pitt the Younger started the income tax in 1798, the peak rate was 10%. This gave them an opportunity to build sound tax administration under conditions of low load. Once this was done, the road to higher tax rates was available. In similar fashion, Singapore started with a GST rate of 4%, and then went up to 7%. The Japanese GST rate was also 3% at inception, and has now been moved up to 8%. In India, we never made the tax administration work at low rates of tax; premature load bearing was attempted by jumping to high tax rates without adequate load bearing capacity in the form of a well designed tax administration. A standard debate in tax policy is about the choice between a low rate and a wide base versus higher rates applied on a smaller base. The traditional economics argument has been that the distortion associated with a tax goes up as the tax rate squared, so for a given level of tax revenue we are better off with a low rate and a wide base. A simple tax system with low rates will help lower the extremely large value for the Indian Marginal Cost of Public Funds. The argument presented here gives us one more perspective on the problem. Low tax rates are a low load from a public administration point of view; until load-bearing capacity has been created, it is unwise to subject the system to high load. There is an interesting tension here between two different ways to make the load smaller. A lower rate requires a large base. The wider base involves a bigger tax administration machinery, and a larger number of transactions. A large number of transactions induces a greater load. But a higher tax rate changes what is at stake and increases the load substantially. First, design a very simple tax policy (e.g. a single rate comprehensive GST) with low discretion at the front line employees, so as to keep the load low. At first, set very low tax rates, to reshape the incentives of citizens and tax officials, to keep the load upon public administration low. Build and run a tax administration which is able to deliver sound tax revenues under these conditions. E.g. a 5% comprehensive VAT rate should generate VAT collections of near 3% of GDP. This requires sophisticated thinking about tax administration. Use independent private studies (e.g. comprehensive audits of some persons) and perception studies to measure the extent to which bribes are paid instead of tax. Only after this is working well, consider moving up to higher tax rates and/or a more complex tax policy. How can a GST be designed so as to have low load? If we wanted to walk before we run, how would we design the GST? A low single rate of 12-15%. Multiple rates significantly increase the workload. A single rate and comprehensive base, which simplifies the workflow and reduces discretion and eliminates classification disputes. Centralised registration. State-wise registration administration work load, and compliance burden for taxpayers manifold - 36 times for those who have to register in all of the states and union territories. Automatic refunds of excess credits, without discretionary approval by officials. Eliminate the concept of self-supplies within a legal entity, as the number of transactions increases several fold if self-supplies are made taxable. No supply should be reckoned unless there is another person to whom a supply can be made. The system of penalties and assessments needs to be simple, with a bias in favour of low discretion and low penalties. There has been a lot of focus on the `revenue neutral rate'. One twist on this is that the government is a significant buyer of goods and services. Thus the `budget neutral rate' would be a bit lower than the revenue neutral rate. This makes it possible for the rate to be lower when compared with the conventional analysis. Single registration is a subject of some debate. Even when each state has its own GST law, it is very much possible to have single registration. The law would impose the tax on taxable supplies made in the state, allow input tax credits, and specify reporting obligations for information. These provisions will apply to any person registered in the country. There need not be the requirement of separate registration in each state. Computations of tax and reporting of the information could be on a single return with state-wise annexures. The key difference between state-wise and central registration would be that all of the state-wise compliances would be on a single registration portal, and the person will be treated as a single person (note that under the current Model law, each registration number is treated as belonging to a different person). This is how the Canadian GST operates, i.e., with single registration, but with multiple federal and provincial GST laws. Does GST implementation require single control? We think single control is neither desirable nor feasible. Scrutiny and audits at the state level will necessarily require information on the dealer on a Pan India basis, which individual states would not have. Both the Centre and States would want to monitor compliance with their respective tax laws. If they want autonomy in administration of the GST, what is needed is a harmonisation agreement to avoid duplication of administrative effort and inconsistent policies across the country. For example, the governments should agree on a common rulings and interpretations authority, and common administration guidelines. A clean solution would be to have a common audit and scrutiny function that is jointly staffed by Centre and State officials. Some 12 States have already opted for a full-service model of GSTN, under which even scrutiny and audit would be done by GSTN. The 122nd Amendment is a great step forward. It opens the possibility that India will become one country, one market. At present, tax administration in India works poorly. We do not know how to build a capable and uncorrupt tax administration. In the absence of this State capacity, we should start with a GST design that imposes a low load upon tax administration. Only after this is proven to work at high levels of probity and operational efficiency can we consider the possibility of going up to higher levels of load. This concept can be expanded to all of the GST in all of the States. To keep the load low, we need to expand the Prime Minister’s vision of One India, One Tax, to “One India, One Tax, One registration, and One Rate”. Satya Poddar is a senior tax advisor with Ernst & Young in India. Ajay Shah is a researcher at the National Institute for Public Finance and Policy. The Finance Bill, 2016 amended the RBI Act, 1934 to establish the objective for RBI (where previously there was none): an inflation target. With the enactment of this law, the RBI is committed to meet pre-announced inflation targets within a specific period of time. For long, India has faced the adverse consequences of a discretionary monetary policy (link, link). Inflation targeting (IT), if implemented successfully, will improve accountability, certainty and transparency in India's monetary policy, and help stabilise the Indian macroeconomic and financial environment. The weak link today is the monetary policy transmission (MPT). In the absence of strong and reliable links between the policy instruments controlled by the RBI and aggregate demand in the economy, it becomes difficult to do IT. In a recent paper (Mishra, Montiel, and Sengupta, 2016), we present evidence of a weak monetary policy transmission in India. How does India fare in the factors that affect MPT? How effective is the bank lending channel of MPT in India? Changes in monetary policy instruments translate into changes in aggregate demand through three main channels: bank lending or the interest rate channel, the exchange rate channel, and the asset price channel. The effectiveness of these channels is shaped by the extent of capital controls, policy constraints on exchange rate flexibility, and the structure of the financial system. Financial markets integration and Exchange rate regime: According to Robert Mundell's "impossible trinity", in an economy with fixed exchange rate, monetary policy loses autonomy of choice when there is high integration between domestic and international financial markets. On the other hand, under a floating exchange rate, as the degree of financial integration increases, the power of monetary policy to affect aggregate demand increases. We show in the paper that India has a relatively closed capital account in de facto terms, compared to major emerging economies such as Argentina, Brazil, Chile, Colombia, Israel, Malaysia, Mexico, Thailand, Turkey, Russia and South Africa. The exchange rate of the Rupee is determined in the interbank market. The RBI periodically intervenes in that market, buying and selling both spot and forward dollars at the market exchange rate. The limited degree of financial markets integration and RBI's interventions in the foreign exchange market are likely to mute the exchange rate response to monetary policy. Structure of the domestic financial system: According to Mishra, Montiel and Spilimbergo (2012), MPT works better as the size and reach of the financial system increase, the degree of competition in the formal financial sector goes up and the domestic institutional environment lowers the costs arising from financial frictions. We present evidence in our paper that the size of the formal financial system in India, measured by conventional indicators (such as the number of bank branches scaled by population or the percentage of adults with accounts at a formal financial institution) is relatively small compared to other advanced and emerging economies. The formal banking sector does not intermediate for a large share of the economy and is highly concentrated. India lags behind advanced and emerging economies in developing its bond market. Indicators of domestic institutional environment such as rule of law, regulatory quality, control of corruption, and political stability, show that India is roughly at the global median. This suggests that the kind of public goods on which the financial system depends (such as enforcement of property rights, accounting and disclosure standards) may not be as readily available in India as in other countries. This would make financial intermediation a costly activity, weakening the effect of monetary policy actions. There are two stages of the transmission process in the bank-lending channel, (i) the transmission from policy instruments to bank lending rates and (ii) the transmission from bank lending rates to final outcomes such as inflation and output. We use a structural vector autoregression (VAR) model in the paper to estimate the effects of a shock to monetary policy instruments on outcome variables through the impact on bank lending rates. The VAR model captures the full dynamic interactions among all the variables of interest. Given a shock to say the policy rate, it is possible to trace out the responses of all other variables to that shock, period by period. In India, two broad groups of instruments have historically been used by the RBI to conduct monetary policy: (i) price based instruments such as the repo rate and the reverse repo rate: these affect the cost of funds for banks, and (ii) quantity-based instruments such as the Cash Reserve Ratio (CRR) and Statutory Liquidity Ratio (SLR): these affect the supply of banks' loanable funds. We consider the effects of four instruments in our analysis: (i) the repo rate, (ii) the average of repo and reverse repo rates (price indicator), (iii) the sum of CRR and SLR (quantity indicator), and (iv) a composite score-based indicator of monetary policy stance. The price and quantity indicators have generally moved in the same direction during our sample period of 2001 to 2014. The exception is between 2011 and 2012, when increases in the policy rates suggested a tightening of monetary policy while the quantity indicator continued to move in a loosening direction. To address this complication, we construct a score-based indicator of monetary policy stance following Das, Mishra and Prabhala (2015). We assign scores of 0, +1, -1, respectively if there is no change, an increase, or a decrease in the values of the four monetary policy instruments in any given month during our sample period. We calculate the overall stance of monetary policy by taking an unweighted sum of the scores for the individual instruments. We use the "benchmark prime lending rate (BPLR)" of the banking sector till June 2010 and the "base rate" thereafter. Till 2010, the BPLR determined the interest rates charged by Indian banks on different categories of loans. From July 2010, it was replaced by the average base rate charged by the five largest commercial banks. We use the seasonally adjusted headline CPI inflation as an outcome variable. Another outcome variable is the output gap measured using the Index of Industrial Production (IIP). Since IIP covers only the manufacturing sector, we interpret the results on transmission to output with adequate caution. We motivate our choice of endogenous variables in the VAR model using a modified version of the simple, open-economy New Keynesian model developed by Adam et. al. (2016). The model consists of an IS equation, a New Keynesian Phillips curve, an uncovered interest parity condition, an interest rate pass-through equation, and a Taylor-type monetary policy rule. Consistent with this model, we estimate a VAR for India with five endogenous variables: output gap, inflation rate, exchange rate, bank lending rate and the monetary policy instrument. Shocks to the world food and energy prices may exert important effects on inflation in India. Since India is less likely to affect world food and energy prices, these prices measured in US dollars can be considered exogenous to developments in India. So we include these as exogenous variables in some versions of our estimated VARs. This is important because to the extent that shocks to either of these variables may help predict future headline CPI inflation in India, excluding them would undermine the identification of monetary policy shocks in India. We follow two alternative identification schemes in the paper. One in which the monetary policy variable is ordered first, reflecting the assumption that the RBI does not observe (or does not react to) macroeconomic variables within the month, but the macro variables are potentially affected by monetary policy shocks contemporaneously. In this scheme the monetary policy variable is ordered first, followed by the bank lending rate, output gap, CPI inflation and exchange rate. In the second scheme, the RBI responds to macro variables within the month, but those variables in turn respond to monetary policy only with a lag. Monetary policy variable is ordered last in this scheme and the ordering of the other variables remains the same. Across both identification schemes and for all four monetary policy measures, a tightening of monetary policy is associated with an increase in bank lending rates. However the effect is statistically different from zero only at the 90 percent confidence level. This suggests that there is weak evidence for the first stage of transmission in the bank lending channel. The effect of monetary policy changes on bank lending rates is hump-shaped, with the peak effects appearing between 5-10 months in all the cases considered. The pass-through from the policy rate to bank lending rates is incomplete. For example, an increase of 25 basis points in the repo rate, is associated with an increase in the bank lending rate of only about 10 basis points. The effect of monetary policy changes on the exchange rate is not statistically significant for any of the four monetary policy measures used. This suggests a non-existent exchange rate channel of MPT in India. Our results provide no support for the second stage of transmission in the bank lending channel. We do not find evidence of effect of monetary policy changes on either the CPI inflation rate or the output gap. A low degree of de facto capital mobility, RBI's interventions in the foreign exchange market, and the structure of the financial system suggest that the exchange rate and the asset price channels of MPT have low effectiveness in India. The burden of monetary transmission is likely to fall on the bank lending or interest rate channel. We present new evidence in our paper that the bank lending channel of MPT does not work well either. With the adoption of IT, RBI has taken a step in the right direction. The enactment of the law by itself will not achieve price stability. A strong transmission mechanism from the policy rate to aggregate demand is crucial for the successful implementation of the new monetary policy framework. The legal mandate of IT must now be used to improve the effectiveness of MPT. Das, Abhiman, Prachi Mishra, and Nagpurnanand Prabhala (2015), The Transmission of Monetary Policy Within Banks: Evidence from India, mimeo. Li, Bin Grace, Stephen O'Connell, Christopher Adam, Andrew Berg, and Peter Montiel (2016), VAR meets DSGE: Uncovering the Monetary Transmission Mechanism in Low-Income Countries, IMF Working Paper, No. 16/90. Mishra, Prachi, Peter J. Montiel, and Antonio Spilimbergo (2012), Monetary Transmission in Low-Income Countries, IMF Economic Review, 60, 270-302. Mishra, Prachi, Peter J. Montiel and Rajeswari Sengupta (2016), Monetary Transmission in Developing Countries: Evidence from India, IMF Working Paper, No. 16/167. Rajeswari Sengupta is a researcher at the Indira Gandhi Institute for Development Research, Bombay.